The Preview Schedule Module was designed for a few key users in your organisation to Publish multiple scheduled events at one time. This is NOT a system module that athletes or regular coaches need access to. Access to the Preview Schedule Module was designed to allow a user to view 1-2 weeks of "Draft" data (unpublished and hidden from any users). 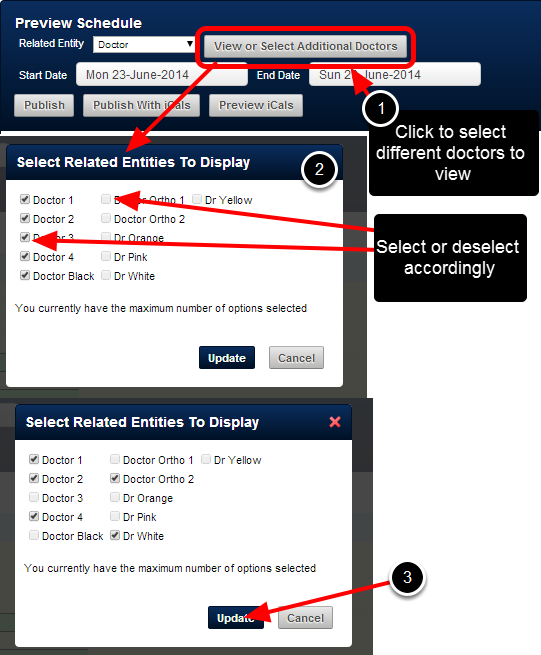 Then, multiple events can be published scheduled at once. This turns all Draft (hidden) data into Published events that are accessible to that any users with access to the event form. It enables users to see all Draft and Published Scheduled events for any Related Entities used in the Schedule forms that the user has access to (e.g. Doctor, Room etc.). Zoom: It enables users to see all Draft and Published Scheduled events for any Related Entities used in the Schedule forms that the user has access to (e.g. &nbsp;Doctor, Room etc.). The image in the example here shows that published (green) and unpublished events appear in the preview schedule module. N.B. You can only publish Scheduled Events that you have access to, for the users and Related Entities that you have access to. Ideally, a main administrator who has access to Publish Scheduled Events via the Preview Schedule Module, should have access to all athletes and all Scheduling Event Forms. 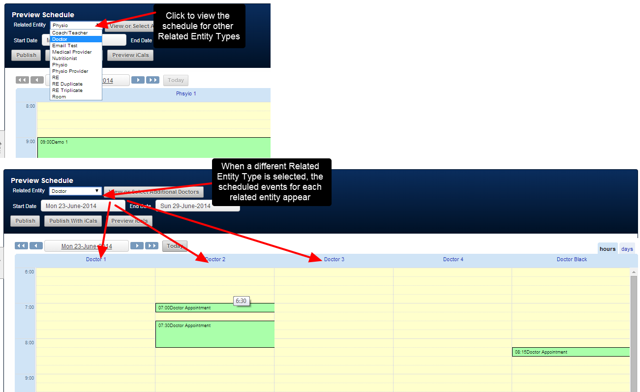 Any conflicts (double bookings for a single related entity) will appear for ALL Related Entities Types for the time period you have selected. In the example here, you can see that a number of conflicts exist for the Coach/Teacher Related Entity Type for the related entity "Anderson". 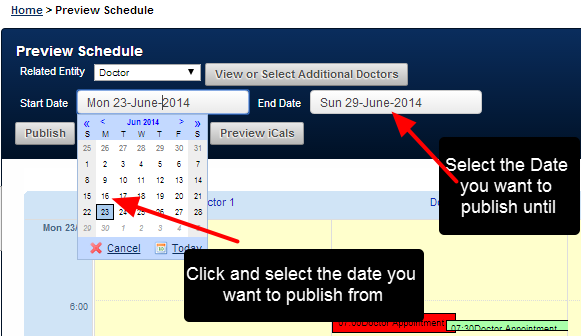 E.g When Doctor is selected, the schedule events for a Doctor appear.